‘It is now about being a fund raiser, and a friend raiser, and a hellraiser,’ Aaron Sherinian told Global PR Summit attendees in 2013, a fitting caption to a career that has soared since he took on oversight of the UN Foundation’s public relations in 2010, before adding marketing a couple of years ago. Sherinian has proved remarkably adept at building brand coalitions around social purpose, galvanizing such large-scale initiatives as the Social Good Summit, #GivingTuesday, Rio+Social and the Momentum1000 global social media rally. Along the way, he has cultivated a healthy media profile, helped by a particular penchant for social media, and a willingness to speak up on a range of issues. 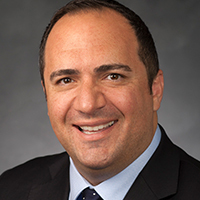 Prior to joining the UN Foundation, Sherinian held numerous positions with the State Department in various countries across the world, including Ecuador, Colombia, Armenia and Costa Rica.